Still stuck? Check out DoubleJump's Shin Megami Tensei: Persona 3 Official Strategy Guide! Shin Megami Tensei: Persona 3 (ペルソナ3, Perusona 3?) is the fourth game in the Persona RPG series. The game was developed and published by Atlus for the PlayStation 2. Persona 3 was released in Japan on July 13, 2006, and was set to be released in North America on July 24, 2007, but was delayed to August 14, 2007 (due to a manufacturing error with the Persona 3 art book). It was released in Europe and Australia on February 29, 2008. 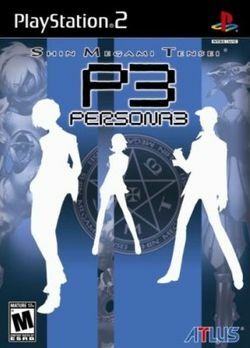 An add-on chapter, entitled Persona 3: FES was released in Japan on April 19, 2007, and a combined release of the original game plus add-on chapter in North America on April 22, 2008. A PSP version with reduced graphics and lacking the extra content from Persona 3: FES, but featuring the ability to play as a female protagonist with a new storyline, was released on November 1, 2009 in Japan, July 6, 2010 in North America, and April 28, 2011 in Europe, with the European version being published by Ghostlight. The game has the player take the role of a male high-school student who joins up with other members of SEES—-the Specialized Extracurricular Execution Squad-—to attack Shadows and other beings that emerge during the "Dark Hour", a time period between each day which only few humans are aware of. The player uses weapons and magical abilities gained by the use of "Personas" to defeat foes in a turn-based combat system. An iconic feature of the game is the method by which the members of SEES release their Personas: by firing an Evoker, a gun-like object, at their head, which does no damage but causes sufficient emotional stress to cause the Persona to appear. In addition to typical RPG elements, the game includes elements of dating sim games as the player character progresses day by day through a school year, making friends and relationships that improve the strength of his Personas in battle. The game was well-received by critics and earned several gaming awards for 2007. The North American version of Persona 3 contains the aforementioned art book, along with a soundtrack CD. This page was last edited on 8 November 2011, at 11:18.